Before taking off, I asked RG and Pilgrim what advice they’d give to a noob. RG said just don’t get discouraged. Pilgrim said don’t take advice from people who don’t get what you’re doing. And you’ll always be tweaking your gear and learning new ways of doing things, even when you’ve been at this quite a while. And that’s fine. 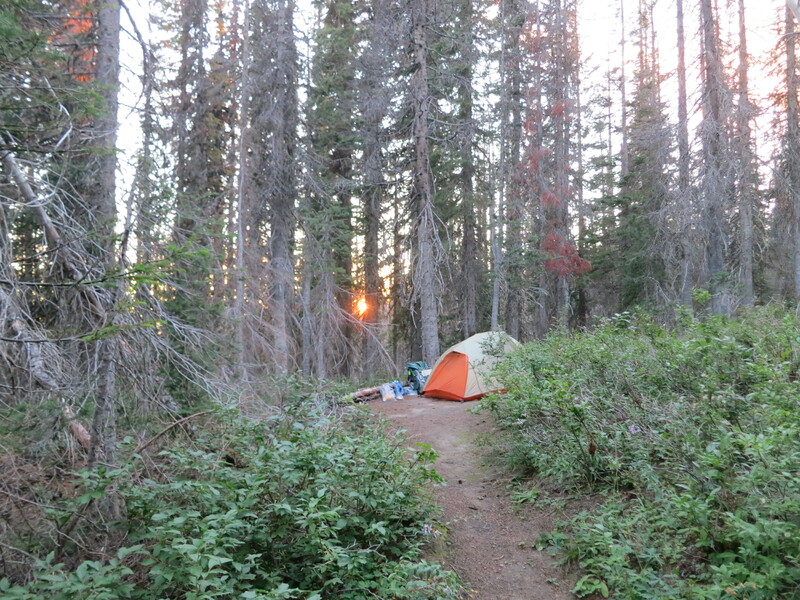 I purveyed more Trail Magic, giving all of my leftovers to RG and Pilgrim. I now have only two 3000-calorie per day packs, which will give me enough left over for an extra day, in case I get delayed. Closest yet to my sweet spot. I need to plan for 12-mile days, and take less food. I’m putting together a rough meal plan, which includes a lot more fat, less carbs, more electrolytes, and less pre-fab meals. My pack feels a lot better. Finally. Trailhead information kiosk and registration, as the trail enters the Mt. Adams Wilderness. I stopped at Trout Lake Creek, 2221, to top off my water before the five miles to White Salmon River. I’m still having difficulty with the water need vs water availability balance. I think this will improve with a more steady pace (based on rough incline). Stopped at Terri & Ginger’s camp to look over maps. Terri, Ginger, and I, at White Salmon River. I had so much fun hiking with these two! I stopped with Terri and Ginger, and chatted and discussed routes, and then I headed another three miles uphill. After a mile plus, I climbed into the Cascade Creek Burn. Just before entering the burn, you get this sign. The winds that night were fierce, and it was easy to see how trees could collapse. Fortunately, I camped outside of the burn. Eerie, and desolate. And suddenly there was a lot more light. Many of the trees were barely standing, resting mostly on a shell of empty bark. I wouldn’t want to be here in a windstorm. Entering the 2012 burn area, which covers a large portion of the west side of Adams. 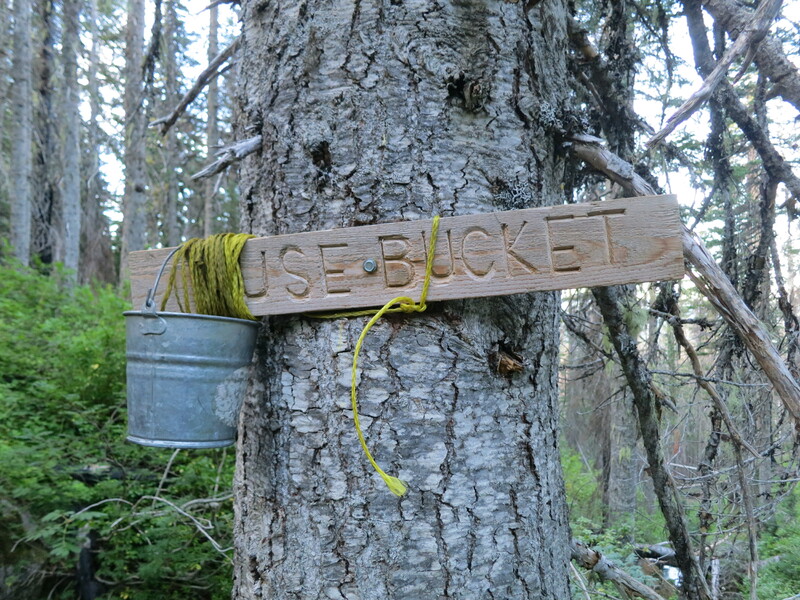 My tentsite is just past the burn, and next to a spring which requires the use of a bucket. Cool! Water sign pointing the way to the bucket spring. And you carefully lower the bucket down into the small spring outlet. This was my favorite unconventional way to get water. Miraculously I have signal, so I got to talk with the guys! One more day in the mountains, and I plan to make the most of it. The sun sets over my last camp.